The mission of the Jefferson County Recording Department is to diligently and professionally serve the needs of the Courts, legal community and citizens of Jefferson County, Alabama, balancing the use of courteous, personal service and technology to achieve an unmatched level of efficiency and customer satisfaction. Here you will find a wealth of information to assist in your dealings with land records and public filings. 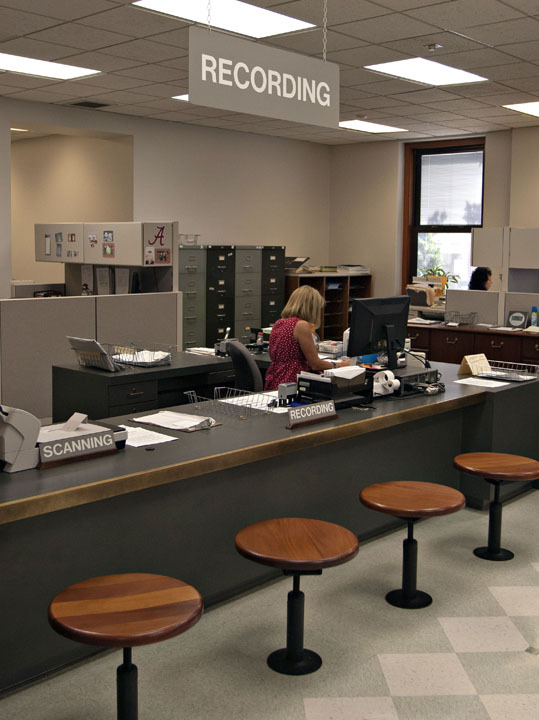 In addition to general information about the operation of the Clerk’s offices, you will find fee schedules and a library of downloadable forms. We also provide answers to a number of frequently asked questions and links to other web sites of interest. Subscribers to our LANDMARK WEB service have access to our land records and public record filings in Probate Court via an easy-to-use web interface and may view images of select documents on file with the Recording Department. Our Record Room Clerks provide free on-site training to subscribers. Jefferson County, Alabama has two Probate divisions, Birmingham and Bessemer. Both offices provide services under the purview of the Probate Judge, the Deputy Probate Judge and the Chief Clerk. We sincerely hope that you find our site to be helpful.